I remember when I first moved to Dubai years ago, you could only buy parsnips at Christmas time. It was as though we only ate them annually. Wrong fam. The things that should only get to rear their heads once a year are trifle, pavlova and that dry fruitcake shite with that thick white icing. They all belong in the bin. But parsnips? No,no,no. Those tasty root veg need to be available always to knock up rocking roasties, marvelous mash and this here scrummy soup. Prepare your veg, garlic and ginger. Sauté your onions to soften (don’t brown). Add garlic, ginger and spices and sauté for a minute or so until fragrant. Add the parsnips and stock and bring to the boil. Lower heat, partially cover with lid and simmer until parsnips are cooked through. Remove from heat and use a stick/immersion blender to puree until smooth (you could also use a blender or food processor, but this is easiest and less clean up). Add the coconut milk and combine, then season with salt and pepper. Stir through the grated apple. 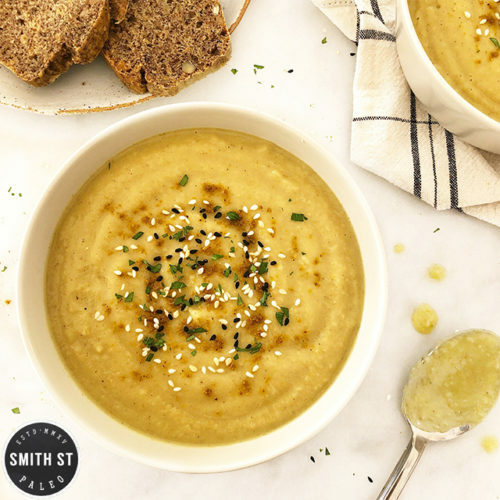 Once apple has softened in the hot soup, you can puree again to make it smooth or leave it with texture. Makes approximately 2 litres (6 serves).